Were Kant's tables of judgements and categories ever extended beyond the 12 sub-classes by anyone? Kant himself wrote the project would be easy so he didn't bother to extend to sub-sub-categories or -judgements systematically himself, only giving occasional remarks by the half of his Critique of Pure Reason. I've some ideas how the tables can be extended, but the project seems laborious. Any tips (to eg existing projects) would be appreciated. 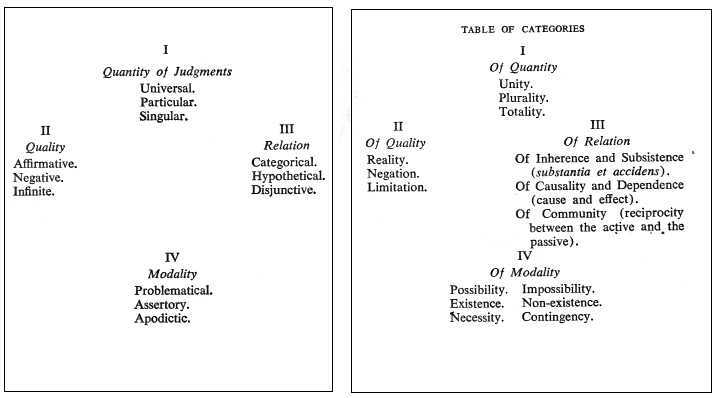 Stephen Pearl Andrews, 'REVISAL OF KANT'S CATEGORIES', The Journal of Speculative Philosophy, Vol. 8, No. 3 (July, 1874), pp. 268-275. To follow up on this, see T. K. Seung, 'Kant's Conception of the Categories ', The Review of Metaphysics, Vol. 43, No. 1 (Sep., 1989), pp. 107-132. How were Kant's antinomies originally formatted in print?